Peeta Mellark from The Hunger Games may be a fictional character, but that doesn't make his fan girl population any less zealous. 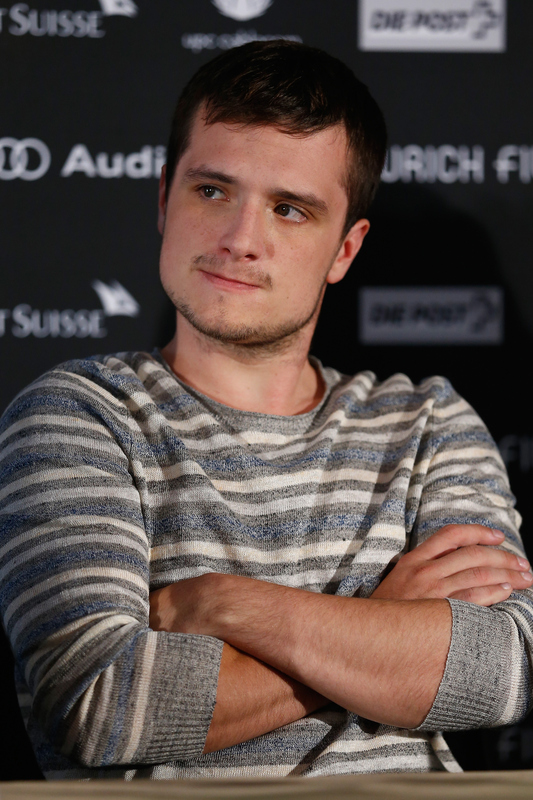 Quite the contrary, it makes the adoration for his real-life portrayer Josh Hutcherson all the more emphatic. If you're amongst that coven, you must be dying to know: does Josh Hutcherson have a girlfriend? Well, friends... It's complicated and confusing. I do know, however, that he is a dude in his 20s. Thus, if he's not in a relationship, he's probably on Tinder. That is, if there exists a special, secret Tinder for hot young rich people with recognizable names. After all, Hutch, as I will continue to call him throughout this post, has allegedly played the proverbial Hollywood field in the past. The Mockingjay actor has been linked to a long list of starlets including Journey 2: The Mysterious Island co-star Vanessa Hudgens, Victorious' Victoria Justice, and The Carrie Diaries' AnnaSophia Robb. For a spell, people were convinced that he dated Ariana Grande, until that was proven to be not true at all. There's been some wishful thinking out there that Hutcherson dated Hunger Games co-star Jennifer Lawrence. After all, their buddy chemistry is pretty atomic. However, it looks like Lawrence has become spooning partners with Chris Martin, so the prospect of real life Katniss/Peeta being anything beyond platonic is pretty slim. Welp, ya never know. Sometimes best friends can lead to best LOVAHS! In the meantime, while we wait for that fantasy union to materialize, it looks like Josh Hutcherson may still be dating long-rumored girlfriend Claudia Traisac. They were seen snogging on the streets of LA in 2013, which everyone basically took as their DTR moment. However, we haven't been sure of their status lately. But hark! Recent evidence would substantiate that the Escobar: Paradise Lost co-stars are still on like Donkey Kong and such. Sugarscape reports that the pair was acting rather amorous while promoting Escobar at the Zurich Film Festival on Monday. When they jumped into a car post-junket, Traisac draped her arm lovingly over Hutch's shoulders. The following photograph either shows the pair caught in a totally out-of-context, serendipitously affectionate moment, or a prolonged gesture of romantic tenderness. While we can't confirm anything for sure, it looks like Hutch may be spoken for. Nonetheless, this study is partially inconclusive. That said, keep on the lookout for an incognito Tinder profile if you're in the LA area.